Authors: Jeong Ki Kim , M.D., Byoung Seok Park , M.D., Mi Jung Park , M.D., Won Choi , M.D., Seong Kwon Ma , M.D., Myong Yon Nah , M.D., Chung Ho Yeum , M.D., Kwon Jung , M.D., Seong Cheol Lee , M.D., Soo Wan Kim , M.D., Nam Ho Kim , M.D., Young Joon Kang , M.D., Ki Chul Choi , M.D. Background:The present study was aimed at investigating the predictive parameters of erythropoietin (epoetin) hyporesponsiveness in patients on continuous ambulatory peritoneal dialysis (CAPD).Methods:We studied 40 patients with end-stage renal disease who had been receiving CAPD for at least 6 months and epoetin therapy for at least more than 2 months. Pearson’s simple correlation and multiple stepwise linear regression analysis was used to discover what parameter can predict epoetin resistance. We expressed epoetin resistance index (ERI) as ‘weekly epoetin dose/hematocrit/body weight’. The dose of epoetin is titrated by about 25% every 2 to 4 weeks to maintain a target hematocrit level between 33% and 36%.Results:We analyzed the relationship between ERI and other predictive parameters by Pearson’s correlation. These results showed ERI has a statistically significant correlation with transferrin saturation (TS) (r=−0.327, p=0.042), total weekly Kt/Vurea (r=−0.423, p=0.018), serum albumin level (r=−0.458, p=0.003), normalized protein catabolic rate (nPCR) (r=−0.479, p=0.006), normalized protein equivalent of total nitrogen appearance (nPNA) (r=−0.488, p=0.005) and serum C-reactive protein (CRP) (r=0.332, p = 0.036). Regression analysis was performed using stepwise linear regression for multiple variables to discover the most independent variable which is correlated with ERI. ERI was entered as a dependent variable, whereas the other parameters (age, duration of peritoneal dialysis, serum albumin level, CRP, serum ferritin, total weekly Kt/Vurea, nPCR, nPNA, serum iPTH, serum aluminium, TS) were entered as independent variables. This analysis showed CRP is the most significant variable and, if CRP is excluded, nPNA is the significant variable. 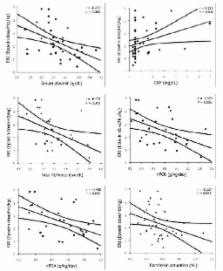 CRP has a statistically significant correlation with serum albumin level (r=−0.418, p=0.007) and total weekly Kt/Vurea (r=−0.366, p=0.043). High CRP group has more increased level of ERI (p<0.05), age (p<0.05) and serum creatinine level (p<0.05) than normal control, but more decreased level of serum albumin (p<0.01) and serum iron levels (p<0.05).Conclusion:These results indicate that CRP is the most important predictor of epoetin hyporesponsiveness. We administered recombinant human erythropoietin to 25 anemic patients with end-stage renal disease who were undergoing hemodialysis. The recombinant human erythropoietin was given intravenously three times weekly after dialysis, and transfusion requirements, hematocrit, ferrokinetics, and reticulocyte responses were monitored. Over a range of doses between 15 and 500 units per kilogram of body weight, dose-dependent increases in effective erythropoiesis were noted. At 500 units per kilogram, changes in the hematocrit of as much as 10 percentage points were seen within three weeks, and increases in ferrokinetics of three to four times basal values, as measured by erythron transferrin uptake, were observed. Of 18 patients receiving effective doses of recombinant human erythropoietin, 12 who had required transfusions no longer needed them, and in 11 the hematocrit increased to 35 percent or more. Along with the rise in hematocrit, four patients had an increase in blood pressure, and a majority had increases in serum creatinine and potassium levels. No organ dysfunction or other toxic effects were observed, and no antibodies to the recombinant hormone were formed. These results demonstrate that recombinant human erythropoietin is effective, can eliminate the need for transfusions with their risks of immunologic sensitization, infection, and iron overload, and can restore the hematocrit to normal in many patients with the anemia of end-stage renal disease. Effect of human erythropoietin derived from recombinant DNA on the anaemia of patients maintained by chronic haemodialysis. Ten patients with end-stage renal failure and anaemia (mean haemoglobin 6.1 g/dl, range 4.6-8.8 g/dl) on thrice-weekly haemodialysis were treated with human erythropoietin derived from recombinant DNA (rHuEPO). This was given as an intravenous bolus after each dialysis in rising doses within the range 3-192 IU/kg. All patients showed increases in reticulocyte numbers and haemoglobin concentration and after the first week of treatment none of the four previously transfusion-dependent patients needed further transfusions. In nine patients treated for 12 weeks haemoglobin rose to a mean of 10.3 g/dl, range 9.5 to 12.8 g/dl. Thereafter the dose of erythropoietin was adjusted to avoid a further rise in haemoglobin. During treatment one patient had an episode of hypertensive encephalopathy and two had clotting in their arteriovenous fistulas (complete in one). rHuEPO is an effective treatment for the anaemia of end-stage renal failure but longer-term observations are needed on the consequences of increasing the haematocrit. Effect of serum parathyroid hormone and bone marrow fibrosis on the response to erythropoietin in uremia. Anemia is common in patients with chronic renal insufficiency and secondary hyperparathyroidism. Erythropoietin therapy is effective, but the dose required varies greatly. One possible determinant of the efficacy of erythropoietin therapy is the extent of marrow fibrosis caused by hyperparathyroidism. We examined the relation between the erythropoietic response to erythropoietin and hyperparathyroidism in a cross-sectional study of 18 patients undergoing hemodialysis who had received erythropoietin therapy for one to three years. In 7 patients (the poor-response group), the dose of intravenous erythropoietin needed to maintain a mean (+/- SD) target hematocrit of 35 +/- 3 percent was > 100 units per kilogram of body weight three times a week, and in 11 patients (the good-response group) it was < or = 100 units per kilogram. In all patients, indexes of the adequacy of dialysis and the extent of hyperparathyroidism and aluminum toxicity were determined monthly, and bone histomorphometry was performed. The mean (+/- SD) dose of erythropoietin required to maintain the target hematocrit was 174 +/- 33 units per kilogram three times a week in the poor-response group and 56 +/- 18 units per kilogram in the good-response group. The mean ages, duration and adequacy of dialysis, increment in hematocrit, iron requirements, and serum concentrations of calcium, phosphate, and aluminum were similar in the two groups. The percentages of osteoid volume and surface, the osteoid thickness, and the stainable aluminum content of bone were similar in the two groups. In contrast, the mean serum parathyroid hormone concentration, the percentages of osteoclastic and eroded bone surfaces, and the degree of marrow fibrosis were greater in the poor-response group than in the good-response group (P = 0.03, P = 0.04, P = 0.009, and P = 0.009, respectively). In patients with uremia, the dose of erythropoietin needed to achieve an adequate hematocrit response may depend on the severity of secondary hyperparathyroidism and the extent of bone marrow fibrosis. This is an Open Access article distributed under the terms of the Creative Commons Attribution Non-Commercial License ( http://creativecommons.org/licenses/by-nc/3.0/) which permits unrestricted noncommercial use, distribution, and reproduction in any medium, provided the original work is properly cited. Effect of a silver device in preventing catheter-related infections in peritoneal dialysis patients: silver ring prophylaxis at the catheter exit study. The relationship of visfatin levels with insulin resistance and left ventricular hypertrophy in peritoneal dialysis patients. Automated peritoneal dialysis: a Spanish multicentre study.